I remember seeing this late one night on cable in 1991. I was out in the family room with all the lights off, lying on the couch, and totally absorbed by the movie. 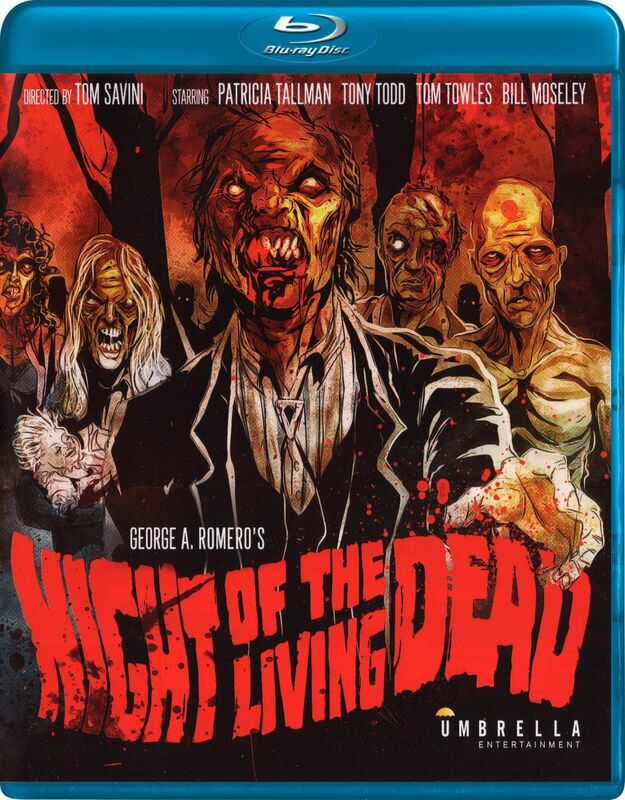 Tom Savini’s remake is one of those rare films I watch that pulls me in totally from the first frame and keeps me there till the very end. Not once do I check the time or think about anything else. Off the top of my head, The 13th Warrior (1999) is another film that does that to me. 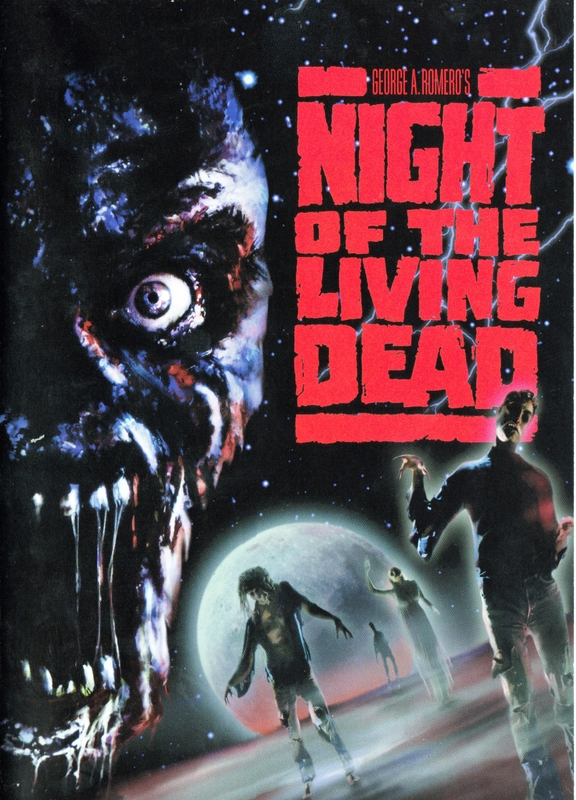 In 1991 I was already a fan of Return Of The Living Dead (1985), which for me is saying something since I was never a fan of zombie movies. It’s still that way today, but if one comes along that has the right characters, story and actors I can be swayed (i.e. SyFy’s series, Z-Nation). I’ve seen George Romero’s zombie trilogy (Night/Dawn/Day), but have never been a major fan of them. 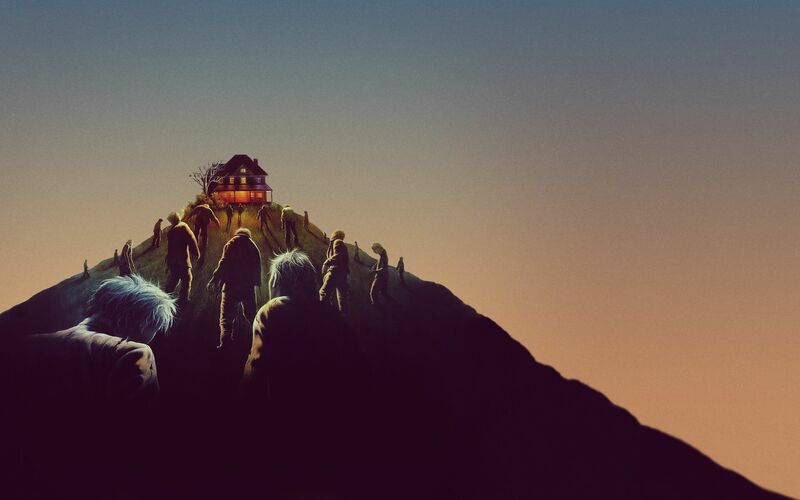 Oddly, it was the remakes of the first two I became a fan of with mostly Savini’s take on Romero’s Night Of The Living Dead (1968) standing the tallest. The Dawn Of The Dead (2004) remake is real good, but it doesn’t pull me in as completely as Night ’90 does. For those not aware there was a remake of Day Of The Dead (2008) done that is just . . . what’s the word I’m looking for—awful! It was a direct-to-DVD version I saw on cable and I quickly came to that conclusion of how awful it was the moment I saw zombies crawling on the wall like Spider-Man, or something. And be warned as of this review there’s a second direct-to-DVD remake of Day in the works too. Oh, the humanity. It’s easy to see why I (and most fans) could get pulled into this flick. It’s about average people having to deal with the worst day of their life, which just so happens to be the end of the world from the dead inexplicably coming back to life and wanting to eat anyone who isn’t like them. Shooting them in the thinker is about the only way you can shut them down permanently. Hitting them anywhere else is just wasting ammunition. Our survivors, however, slowly learn all this as the movie goes on, but how does the end of the world begin for all of them? In this movie just like any other day . . . Barbara (Patricia Tallman) is our heroine and it’s just another day for she and her brother, Johnnie (Bill Moseley), as they head to Evans City Cemetery to visit their recently dead mother. And it’s not too long before Savini hits us with horror. Johnnie and Barbara are attacked by a really jacked up looking dude who ends up killing her brother. Barbara tries to hide in the car but is set upon by two more really jacked up looking dudes. Traumatized, she escapes on foot into the countryside and comes upon a seemingly abandoned farmhouse in the wilds of rural Pennsylvania. Inside she encounters another jacked up dude, more jacked up than the rest, and a dead guy with the back of his head blown out from suicide and an eaten off hand. Soon our hero shows up! Tony Todd is that guy! He’s Ben and the one thing that really keeps you riveted to this movie is how realistically all the actors act horrified and traumatized. 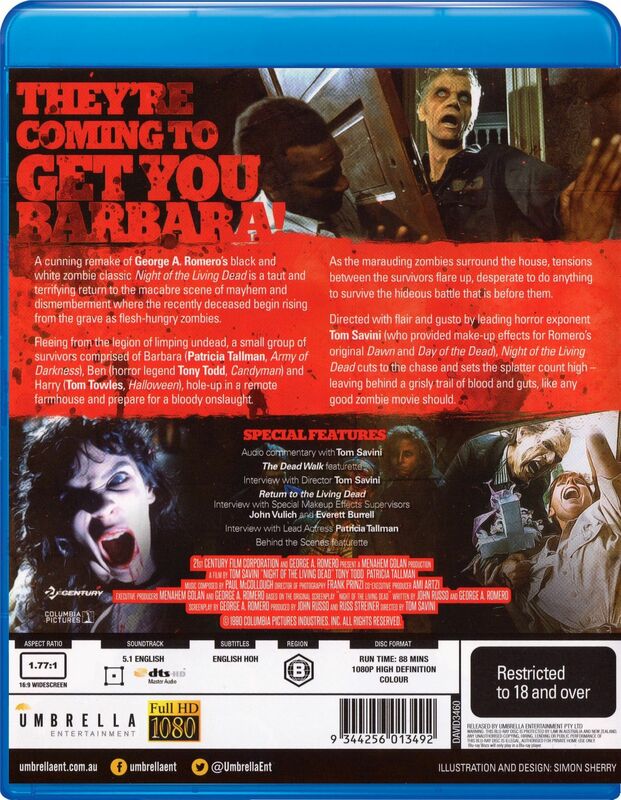 At this point in the film neither Ben nor Barbara really have any clue the dead are coming back to life. While trying to comfort Barbara he relays his experiences with these “jacked up dudes,” seeing one shot multiple times and not going down until he took a hit to the head. Theories abound of a virus driving people insane, government warfare. Eventually they learn the truth and it’s still hard for them all to believe. The dead are walking again! Barbara and Ben are in this farmhouse for a decent amount of time before the other characters show up and they were all hiding in the basement the entire time too scared to come up and help when they heard all the commotion. Our human villain is Harry Cooper (the late Tom Towles), abusive husband to wife, Helen (McKee Anderson) and father to daughter, Sarah (Heather Mazur). Sarah’s been bitten by a zombie and spends most of the movie laid up semi-conscious in the basement. Also hiding out with the Coopers are locals, Tom Bitner (William Butler) and girlfriend, Judy Rose Larson (Katie Finneran). The house they’re all making their last stand in is Tom’s uncle’s. The zombies in this are your basic Romero shamblers, they’re slow and in an ideal situation you could conceivable run right past them, but in large numbers they do present a problem. They’re attracted by sound, and what brings them all to this farmhouse is the constant bickering between Cooper and Ben and all the noise of everyone trying to board up the windows and doors. Yeah, that’s right, noise carries. Ben wants to search for the key to a gas pump a little ways down the road so they can fill up the truck he arrived in, because it’s going to take a full tank, or more, to get some place safe, but Barbara has another idea. These motherfuckers are so slow they could just walk right past them. Using the guns they have that isn’t an entirely bad idea and one I personally think they could have done, but they waited too long. Too many are surrounding the house and meandering around on the property now. In the end, though, Barbara ends up having to do just that. And who was in control of the basement? This movie was my first introduction to actors Tallman, Todd and Towels. Tallman reaching popularity in the science fiction series, Babylon 5 (1994-1998), and Todd became Candyman as well as lending his presence to other genre flicks like The Crow (1994), the Final Destination movies, and Minotaur (2006) just to name three and lending his trademark gravelly voice to speedster villain, Zoom, on the second season of The Flash. Towels is memorable for me from this flick, Stuart Gordon’s Fortress (1992) and John McNaughton’s alien-borrowing-peoples-heads film, The Borrower (1991), but you’ll also remember him from McNaughton’s Henry: Portrait Of A Serial Killer (1986), Rob Zombie’s House Of A 1000 Corpses (2003), its sequel The Devil’s Rejects (2005) and Zombie’s remake of Halloween (2007). Savini had to cut down some gore to get his movie out of the NC-17 trap it was initially dumped into. 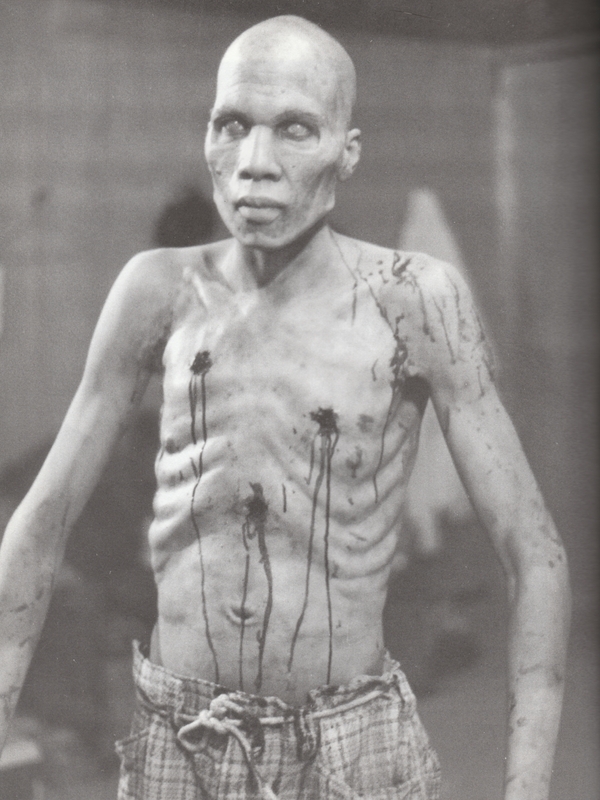 Most of the shots he had to take out, or reshoot tamer versions of, were the shootings of the zombies. Head shots mostly. 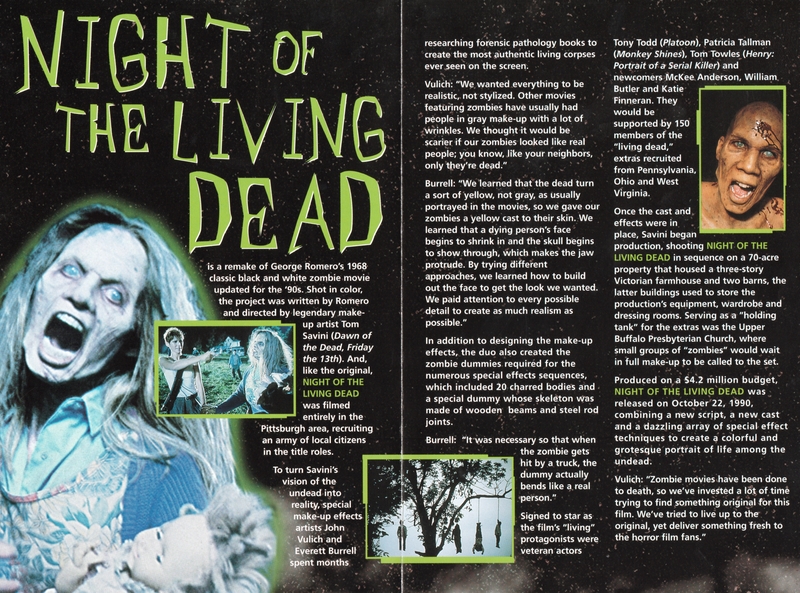 Most of these omissions can be seen in The Dead Walk featurette. 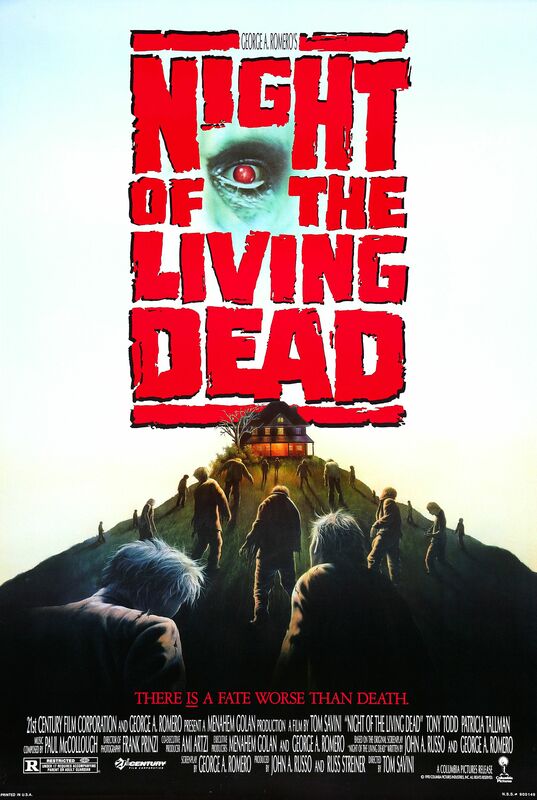 Sony first put out Night Of The Living Dead (1990) on disc back in 1999. It made it’s blu-ray debut in 2012 from Twilight Time, which is now out of print and Umbrella Entertainment’s (Australia) blu-ray hit shelves this past April. You can buy that version at either Amazon or Umbrella’s site depending where in the world you’re based. Video/Audio/Subtitles: 1080p 1.77:1 high definition widescreen—5.1 English DTS-HD Master Audio—English subs only. Back when Twilight Time had Sony’s version in circulation there was heavy controversy over it and the “retooling” Sony did. I never bought their version, nor had a chance to review it, so I can’t personally comment on it, but according to those who owned it Sony tinted a portion of it in blue. For an in-depth look at what they did I recommend reading DVD Talk’s review of it at the time. At any rate, despite it selling out and going out of print almost immediately, a lot of fans hated it, hence why Twilight Time never re-pressed it years later like they occasionally did with select titles that sold out quickly. Umbrella’s pristine looking transfer is not the one Twilight Time distributed! It’s the one Sony had on DVD in 1999, just ten times better looking. Color and detail are excellent! As of this review Umbrella’s blu (and DVD) trumps all previous disc versions. In the extras department it ports over all the extras on Sony’s 1999 DVD (Twilight Time only ported over the commentary and trailer) and goes the extra mile and adds three new featurettes all worth a look. Most of what is recounted by the participants is new material, with a small percentage being expounded upon topics you may have heard or read before. I wonder if Sony will release this themselves one day, and if they do what form will it take? Ideally, if they want to avoid fan backlash they should probably release it with both versions. I’m actually curious to see what they did with it. (Note: FX Artist John Vulich died back on October 12th). 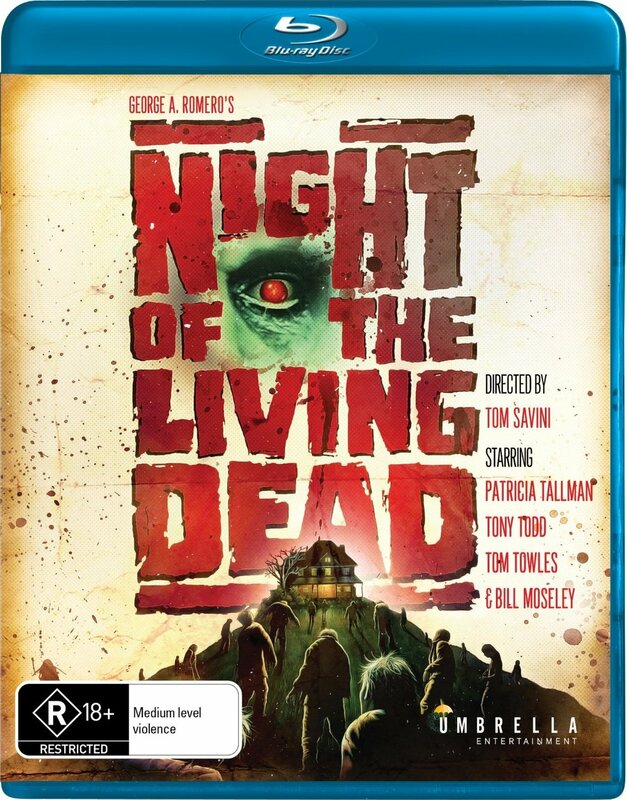 Gallery | This entry was posted in Night Of The Living Dead (1990) Australian Blu-ray (Region Free). Bookmark the permalink.